Often when we read this verse we only notice the praise made unto God – which should be the focus of this verse, no doubt – but there’s one other thing that should be pointed out here – the flaws of a human being. Twice it was repeated in this verse alone that God is not human. Basically, in doing so, God’s reliability is not only emphasized, but the weaknesses of men are revealed. We lie. We change our minds. We speak and then not act. We promise and not fulfill. But God does not. God cannot. We are used to dealing with humans – who are not always reliable, whether by their choice or by circumstances. We are used to doubting. We are used to second-guessing. We’re used to unfulfilled promises and lies. 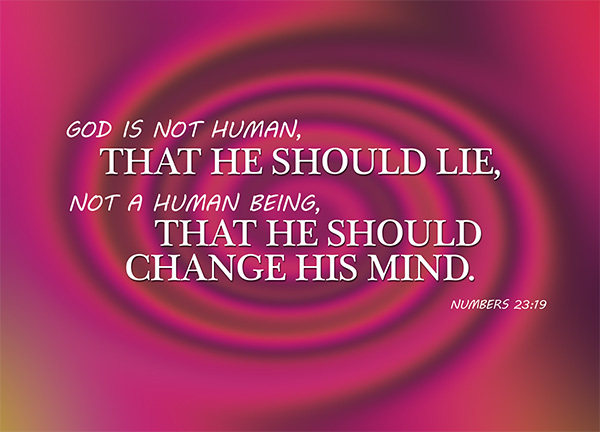 But when we look to God, this mentality needs to change, because there is no way God can lie. In this study, we will examine the nature of God versus the nature of humans, and how this should encourage us to place our trust in the Lord instead of men. This is a fact. It has been repeated again and again in the Bible. That because God is faithful, he keeps his promises even if we fail him. That because he is unable to do something like lying, he will never deceive us like our hearts are capable of [Jer 17:9|Article]. in the hope of eternal life, which God, who does not lie, promised before the beginning of time [Titus 1:2]. This is his nature, and it is not something that will ever change. if we are faithless, he remains faithful, for he cannot disown himself [2 Tim 2:13|Article]. We’re talking about God’s faithfulness. That’s a constant. Does he speak and then not act? Does he promise and not fulfill? – Oh, that he doesn’t. Often, it seems like the promises that God has given are merely empty promises. To the Israelites, it must have often felt that way. It must have felt that way to the Israelites who were suffering in Egypt prior to the exodus, trying desperately to cling on to the promise that God had made to Jacob, their forefather. It must have seemed that way to the Israelites during the exodus, where they spent 40 years making seemingly aimless rounds. It must have seemed that way to the Israelites all throughout the old testament, when they were waiting and waiting and waiting for the Messiah but he never came in most of their lifetimes. It must have seemed that way to the Israelites when Jesus was crucified – when they thought that their saviour was dead, and the promise of God broken. It is true that God runs on his own time. Most of the promises that God made us didn’t include a specific ‘when’. There were promises that God made that included a specific time-frame, for example regarding the birth of Isaac – I will surely return to you about this time next year, and Sarah your wife will have a son [Gen 18:10]. It was fulfilled. There are many other examples, but notably, the general promise that God has for his people regarding deliverance from suffering did not have a time-frame to it. Even though it has been hundreds and thousands of years, God’s promises are still in effect. Heaven and earth will pass away, but my words will never pass away [Mark 13:31]. Not that everyone lies or that everyone would lie, but this is a trait of humanity, isn’t it? Sometimes we lie out of love – because the truth hurts, but that’s still lying. Sometimes lying don’t hurt, but that’s still lying. Sometimes we do not intentionally lie but we subtly mislead and influence the opinions of others. Sometimes we don’t realise that we’re lying, because we are lying to ourselves. There are many kinds of lies, but lies do not come from God. Our God cannot lie, does not lie, will not lie. Where do they come from then? Jesus puts it eloquently – You belong to your father, the devil, and you want to carry out your father’s desires. He was a murderer from the beginning, not holding to the truth, for there is no truth in him. When he lies, he speaks his native language, for he is a liar and the father of lies [John 8:44]. The devil is the father of lies, and it is from the devil, not God, that our lies come. Our God is not human. This was repeated. And most certainly, our God isn’t the devil, that he needs to lie to get our attention. As much as we lie, as much as we make commitments and pledges to God and in the name of Christ and yet break them, God will not break his covenant to us. It is better to take refuge in the Lord than to trust in humans. It is better to take refuge in the Lord than to trust in princes [Psalm 118:8-9|Article]. Why so? Well, many reasons. But one of the more obvious one would be because God is reliable whereas men isn’t. You may doubt the most honest and reliable of men, because he is still a man, and humanity can lie, even if they won’t. But it would be foolishness to doubt God, because he cannot lie and will not lie. God can be trusted. God should be trusted. He is not a human being. He is not you or me. He is God, and God does not lie.